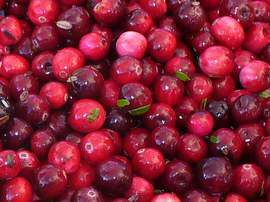 You can preserve cranberries by the same food preservation methods as other berries: freezing, canning, and drying. Drying and canning food preservation methods produce shelf-stable products that are safe for storage at room temperature. When canning, be sure to use tested canning recipes. If you don’t want to can foods, cranberries are easy to freeze. While most other berries are in season in summer, cranberries are in season from early to late fall. Fresh cranberry season usually ends somewhere between Thanksgiving and Christmas. Listed below are several ways you can preserve cranberries for use throughout winter and spring. One pound of fresh cranberries is equivalent to four cups whole berries, or about 2½ cups puree, or 1¼ cups juice. Shop for some of our favorite cooking tools and equipment on the Amazon marketplace. You can quickly find what you need for any food preservation method. Then simply order and pay using your safe and secure Amazon account. Find everything you need to get started with canning, drying, fermenting, pickling, curing, freezing, or sealing foods. Enjoy! Store fresh cranberries unwashed in a very cold (32°F to 40°F) refrigerator, in very humid conditions (80%-90% RH), such as a plastic bag with holes. Stored properly, fresh cranberries will last for up to two weeks. Preserve for longer storage by one of the following methods. Before using whole cranberries, wash them in a basin of clean water and drain in a colander. Pick through them and remove any leaves and soft or damaged cranberries. Preserve whole cranberries by freezing, canning, or drying. If you purchase fresh cranberries already in plastic bags at a grocery store or farmers market, simply place the bags in the freezer for up to one year. Otherwise, wash loose cranberries in a basin of clean water and drain in a colander. Pick through them and remove any leaves and soft or damaged cranberries. Place cranberries in freezer safe plastic bags or other containers. Do not thaw frozen cranberries before using in recipes; simply rinse in cold water and drain. Preserve whole cranberries in unsweetened or sweetened canning liquids or simply heat the berries with sugar to form syrup. Use canned cranberries to make sauce or juice. How to preserve cranberries using the raw pack method with a canning liquid: For each quart (2 pints), wash about four cups cranberries and prepare two cups canning liquid (water, unsweetened apple juice, or sugar syrup—recipe follows). Bring liquid to a boil, then reduce heat to keep hot while filling jars. Ladle a small amount of hot canning liquid into a hot jar. Add prepared (raw) cranberries; pack tightly without crushing, and add hot liquid to cover. Adjust headspace to ½-inch. Process raw pack cranberries in pints for 15 minutes or quarts for 20 minutes (at 0 to 1,000 feet). How to preserve cranberries using the hot pack method with sugar (note that with this method, you get more cranberries in the jar): For each pint, wash about one quart cranberries. In a saucepan, combine cranberries with sugar, from one tablespoon or up to ½ cup, as desired. Less sugar means you can use the cranberries for sweet or savory preparation later. Heat cranberries and sugar over medium heat for 5 minutes, or until sugar dissolves and mixture boils. Boil for 30 seconds. Keep cranberries hot while filling jars; use boiling water to adjust headspace to ½ inch. Reduce heat, but keep cranberries hot while filling jars. Adjust headspace to ½-inch. Process raw pack cranberries in pints or quarts for 15 minutes (at 0 to 1,000 feet). To make sugar syrup: in a saucepan, stir together stir together 2 cups water and ½ to 1 cup sugar (to make light or heavy syrup). The level of sweetness is mostly a matter of preference. Bring to a boil over medium-high heat and stir until sugar has dissolved. There are many uses for dried cranberries. Toss them into cereal or yogurt, add them to baked goods, combine with nuts and other dried fruits in a trail mix, or substitute cranberries in any recipe calling for raisins. Before drying firm berries such as cranberries, you need to crack the tough, waxy skins by a process called “checking”. Checking merely opens the pores in the skin (the same as a nice facial does for your skin). These openings let moisture escape, which ensures complete and speedy drying. Check cranberries by water blanching; simply place washed berries in a colander and dip briefly in boiling water (30 seconds to one minute), and then drain well. If the skins split, you have over-blanched. But they can still be dried successfully. Next time, shorten the blanching time. Preheat an oven or food dehydrator to 130°F to 140°F. Place drained cranberries on drying trays. Dry until pliable for snacking, or until brittle for longer storage. Cool until no longer warm; store in an airtight container in a cool, dry place for about 2 months. Freeze for longer storage. The length of drying time can fluctuate widely and depends on the method used and weather (especially relative humidity). Whole berries can take as little as a few hours to dry, but in humid conditions, may take one or more days to dry. Wash 2 cups fresh or frozen cranberries in cold water and place in a saucepan with ¼ cup water or orange juice. Cook berries over medium heat for 10 minutes, or until skins split. Leave cranberries whole, or puree to desired consistency with a food processor or hand blender. If smooth sauce is desired, strain pureed berries through a wire mesh strainer or food mill. Return sauce to the pan and add 1 cup sugar. If using orange juice, you may also want to add 1 teaspoon freshly grated orange zest. Bring sauce to a boil over high heat. Boil for 3 minutes.. Prepare cranberry sauce and cool completely. Pack into freezer safe containers and freeze up to 1 year. Prepare cranberry sauce, and then reduce heat to keep hot while filling jars. Adjust headspace to ¼-inch. Process half-pints or pints for 15 minutes (at 0 to 1,000 feet). Fruit leathers are made from fruit sauce that is spread thin, and dried until supple and leather-like sheets of chewy fruit. The sheets are usually rolled up and individually wrapped for storage. To prepare fruit leather from tart cranberries, either prepare cranberry sauce, or combine pureed fresh cranberries equally with a sweet fruit sauce such as apple sauce, pear sauce, or pureed pineapple. Alternatively, add honey, corn syrup, or saccharin-based artificial sweetener to pureed fresh cranberries. Puree 2 cups prepared cranberries with about ½-cup natural sweetener or the equivalent amount of artificial sweetener, or to taste. Preheat an oven or food dehydrator to 130°F to 140°F. Line the drying tray with plastic wrap or parchment paper. Spread sauce ¼ to ½-inch thick on the liner. Dry until leather is evenly pliable and firm; there should be no soft spots. Peel from liner while still warm and cut or roll into serving pieces. Cool until no longer warm and then wrap pieces individually. Store in an airtight container in a cool, dry place for about 2 months. Freeze for longer storage. Estimate about 3½ pounds (about 14 cups) cranberries to make one quart of juice. Measure fruit into a saucepan, crush slightly, and add one cup hot water for each quart of fruit. Cook mixture over medium heat, stirring frequently, for 10 to 15 minutes or until soft. Transfer to a fine mesh strainer, or colander lined with a double layer of dampened cheesecloth, and set over a bowl. Drain undisturbed for two hours; pressing the solids will result in cloudy juice, so avoid disturbing the fruit if you want clear juice. Discard solids in the strainer, or use to make cranberry sauce or cranberry fruit leather using the preceding recipes. In a saucepan, combine juice with one to four tablespoons sugar (or to taste). Sugar may be omitted, but helps retain color and flavor. Refrigerate juice and use within three days, or preserve by freezing or canning. Chill freshly prepared cranberry juice in the refrigerator. Transfer to freezer-safe container and freeze up to 12 months. In a saucepan over medium-high heat, heat freshly made cranberry juice to 190°F; adjust heat as needed and keep juice at 190°F for five minutes. Do not boil. (This step is necessary to pasteurize juice and make it safe for canning.) Keep juice hot while filling jars; adjust headspace to ¼-inch. Process pints or quarts for 15 minutes (at 0 to 1,000 feet). For more information about these and other food preservation methods with recipes for all types of foods, buy the book The Home Preserving Bible by Carole Cancler. Using a dehydrator, for me, is the best way to preserve cranberries because it’s quick and easy. I could be biased because I love food dehydrators but compared to freezing and canning, dehydration requires the least effort. Just slice the food and put it on the food dehydrator and leave it.